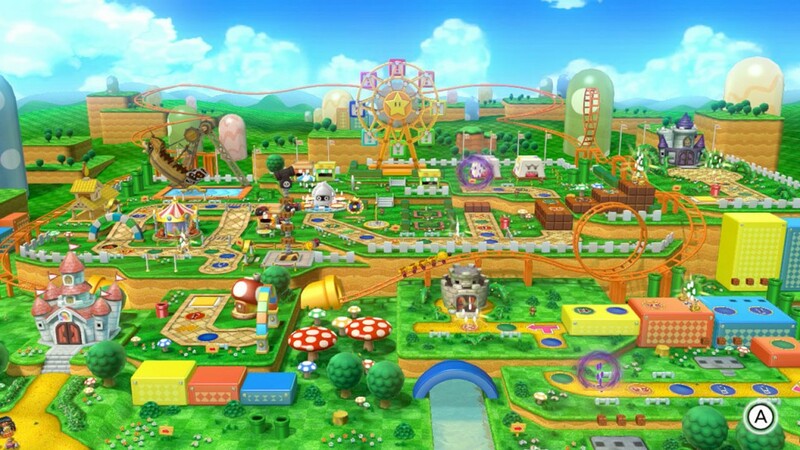 One of its few cool features, the game boards in Mario Party 10 are inspired by the world map’s found in the Super Mario games. It’s been three years since the release of Mario Party 9, and while that game came with fresh gameplay concepts, it didn’t exactly translate to the same fun that previous games in the series had. Unfortunately, the latest entry in the series builds upon these concepts, and the result is a Mario Party game that’s both unrecognizable and undesirable. The long-running Mario Party series has been known to be one of Nintendo’s most popular multiplayer party games. The series was huge before all the Mario-branded sports games and Super Smash Bros. came out, most notably due to the fact that they were so easy to get into. The games were essentially a compilation of simple minigames played to decide the winner of a board game, relying on almost equal parts skill and luck — which a lot of people love to hate it for. Mario Party 10 is still about minigames in board games, but the highlight seems to have changed to focus more on the board games than the actual minigames, and it’s hard to figure out why. The game is also the first to not have a plot, and while it’s true that the stories in previous titles were all mundane and pointless, it it just makes Mario Party 10 all the less charming. 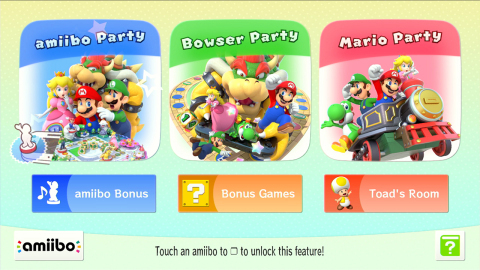 Mario Party 10 has three modes of play, each one more historically confusing than the last. 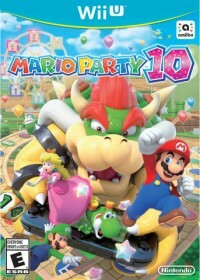 Mario Party 10 features three modes of play and no plot. The first of which is Mario Party mode, which is essentially the standard game of Mario Party fans all know and love, except it isn’t. The length of a game used to be dictated by the number of turns participants would like to take part in. Now you’re limited to typically 30 minutes per board game, or until you get to the last space on the game board. 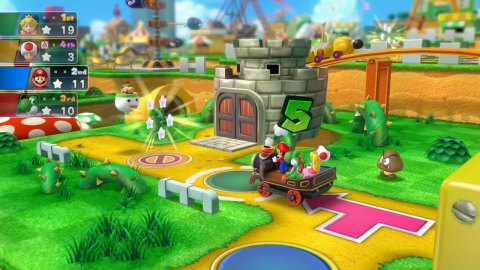 Like Mario Party 9 before it, despite its 4-player competitive nature, all four players are in some sort of vehicle — eliminating the need for each player to explore the game board individually. On top of that, instead of the 10-sided block longtime fans might be used to, we’re treated to the use of a standard six-sided block. This new way to play the game was a welcome addition in Mario Party 9 because it was something fresh, and it brought new strategies into play. Previous games in the series decided the winner based on the number of stars players had, which they obtained by paying 20 coins upon passing a specific space on the board. Mario Party 9 did away with that requirement and made it more about who had the most coins upon getting to the end of the game board. Items like dice blocks that move players backward or had less sides (to prohibit movement to an undesirable space), really brought a strategic element to each board, and while it was nice, it definitely made the game feel different. Sometimes too different. Mario Party 10 employs these exact same tactics, and this is what holds it back from being a worthy entry in the series. Even the minigames have sort of lost importance due to the fact that you don’t play a game after every turn anymore. You only play them when you land on a minigame space. Being the first to get to the star is unfortunately a thing of the past in Mario Party 10. Sure, you can access all the minigames in Mario Party 10 through free play, but it doesn’t have the same dynamic as playing them on the standard game board. Bowser Party exists to give the series’ debut on the Wii U some meaning. Bowser Parties are five-player affairs where the GamePad user has the pleasure of using Bowser, while everybody else is up against him. On the board game, it’s essentially a game of chase. If the four players successfully get to the end of the board, they win. If Bowser knocks everybody off the board before they get to the end, he wins. Four-on-one essentially is unfair, especially since movement for the team can go anywhere from four to 24 spaces, but to even the odds, Bowser can roll multiple dice. If Bowser catches up to the team, a four-on-one minigame is played, and as any Mario Party veteran will tell you, it’s often more desirable to be the one without a team. Most of the four-on-one minigames are virtually one-sided in Bowser’s favor, but there are also quite a few chance games that can go either way. One revolves completely around dice, which I like to think is just utter trolling. 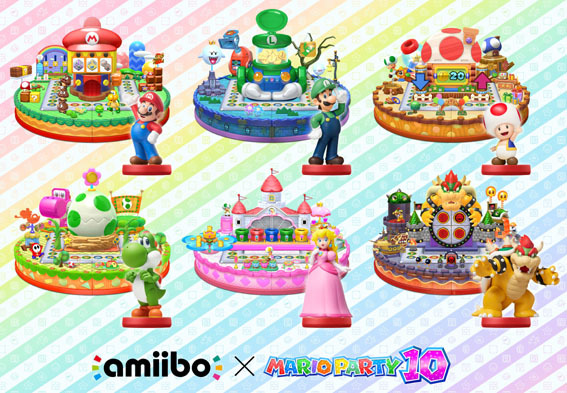 amiibo Party is both the best and worst thing about Mario Party 10. The last mode of play is amiibo Party, which really had the potential to be the best mode in the game, but the amiibo themselves made it annoying. The amiibo Party mode is the closest thing to classic Mario Party you have. The rules are what they were years ago. Blue spaces net you three coins, red spaces lose you three coins, there are good spaces and bad spaces, and it’s all about who has the most stars at the end. So it’s typical Mario Party, right? Almost. Each board in earlier Mario Party games each had its own nuances and look, but in Mario Party 10, it all comes bland. Each playable amiibo has his or her own themed board, which would usually be awesome, but they’re all literally just squares. On top of that, with each turn, you have to put your amiibo on the NFC reader to do little things such as roll the dice or confirm decisions. You can get around this by controlling the GamePad, but switching from Wii Remote to GamePad every so often is annoying. So what’s better, touching your amiibo to the GamePad every three minutes, or switching methods of control? It’s all pretty bad. Mario Party 10 is a really hard game to recommend because it isn’t the Mario Party that most of its fans grew up with. While that may be a poor reason to say the game is bad, the truth of the matter is literally every Mario Party console game before it was a whole lot more enjoyable. To make matters worse, there are significantly less minigames in Mario Party 10 (47) than any other Mario Party (at least 50 each) before it, further indicating this less enjoyable new direction the series seems to have taken. It would’ve been better if this tenth installment of Mario Party included the best minigames and boards from the history of the series, playable in HD. Sure, it wouldn’t really be anything new, but Mario Party 10 would’ve been the perfect entry to play the history card with. The first eight games in the series weren’t too much different from one another, while the ninth finally had differences that made it significantly unique. Unfortunately, the changes made to Mario Party 9 look to be permanent, making it nothing close to what the series was all about. It’s been well-documented in meme culture that the series is all about ruining friendships in front of your TV, but it pains me to say that Mario Party 10 is just a sad waste of time. Mario Party 9 was like going to your best friend’s wedding, not knowing whether or not you liked the spouse. Mario Party 10 is like going to your best friend’s kid’s birthday party. You wish you weren’t there, or even invited. The game was purchased by the reviewer. The game was so bad, he got rid of the game and kept the amiibo.